Welcome to Hadherway Farm's website! 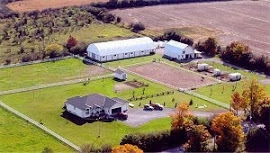 Hadherway Farms is an exciting new equestrian farm located in the heart of the beautiful wine country of Prince Edward County. Awarded ‘Best New Business of the Year 2008, Quinte Business Achievement Awards’. Come join our winning team for year round lessons, camps and new programs. Just two minutes north of Wellington and Loyalist Parkway. We are pleased to offer years of experience for riding lessons, summer camps, birthday parties and boarding. Our purpose and goal is to provide an affordable, fun, relaxed, family oriented facility in which you can pursue your horse filled dreams. Whether you are a young child filled with a longing to ride a beautiful horse or an adventurous adult we have a program suited to your needs. Our horses are quiet, dependable, and eager to help you achieve confidence and skills in riding and horsemanship. Whether your interest is pleasure riding, dressage, jumping, horse trials or gymkhana our individual lesson plans are right for you. Hadherway Farm's philosophy is to provide a venue that is safe, positive, and provides opportunities and experiences that encourage continued development, responsibility and personal growth to all equestrians. 2019 Horse Shows Dates are now posted! More information to follow. 2019 Horse Camp for Kids - New 2019 dates have been posted for March Break and the summer season! © 2019 Hadherway Farms. Site by Pitcher Designs.